It’s a sombre fact that not all kids get an equal start in life, even in our affluent society. In 2011, KickStart for Kids was founded on the belief that every child, regardless of their social or economic background, should have an equal chance to succeed. We facilitate this belief by running school breakfast and lunch programs, mentoring programs and providing basic clothing and healthcare support in South Australian schools. We firmly believe that EDUCATION = POWER and OPPORTUNITY. If children are attending school hungry or encountering hardship, they can’t fully engage with the curriculum, which means they might not achieve the educational outcomes required to succeed. Research shows that children who grow up experiencing hardship are more likely to remain uneducated and live in hardship as adults. • One in ten parents reported their children go one entire day at least once a week with NO FOOD AT ALL. KickStart for Kids aim is to help level the playing field and end this cycle of hardship. 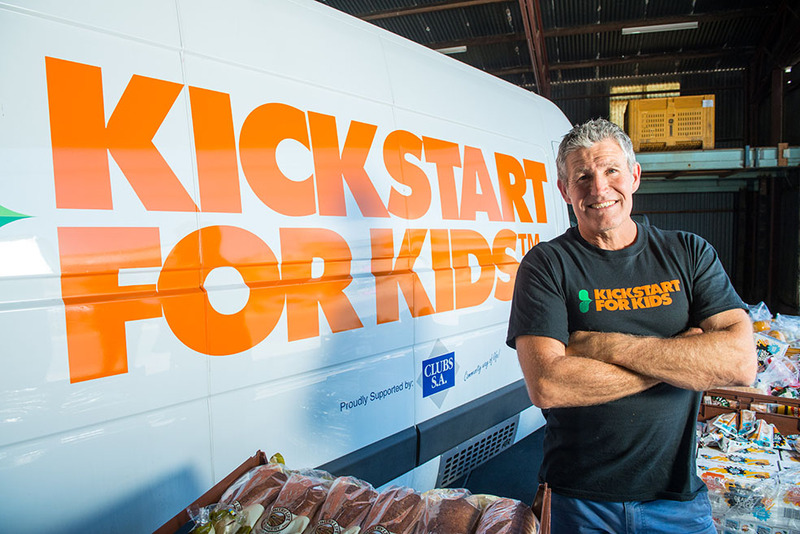 KickStart for Kids founder Ian Steel, a builder by trade and father of three, spent many years mentoring young children experiencing hardship in schools. He observed many instances of poor behaviour and impaired learning ability that he didn’t see in his own primary school aged children, so he decided to investigate why these differences were occurring. Through extensive research and discussion, he discovered that many of the issues he had encountered were directly caused by hunger. Thousands of children were being sent to school without being given breakfast or having any food to eat during the day. In speaking with the schools, teachers and principals told Ian that hunger was having a major impact on kids’ learning ability, self-esteem and overall health. As a father himself, Ian knew he had to do something. One day in 2009, he told shopkeepers at the local shopping centre stories of the children he wanted to help, then went to work. The next day, the shopkeepers contacted him and offered enough food donations for him to deliver breakfast to a school he worked with, so he loaded it into the back of his builder’s ute and took it to the school. He observed immediate results. With food in their bellies, the kids became happier, friendlier, better able to concentrate and had a much greater ability to learn. Ian knew this was the start of something meaningful, so he founded KickStart for Kids. Today, KickStart for Kids supports over 350 South Australian Schools, provides around 50,000 breakfasts and 10,000 lunches per week, and is supported by over 600 volunteers.